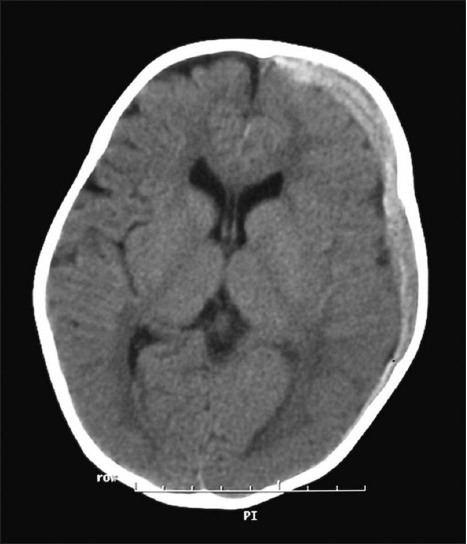 We report one patient with a middle cranial fossa arachnoid cyst in whom rapid spontaneous disappearance of a contralateral post-traumatic acute subdural hematoma occurred. 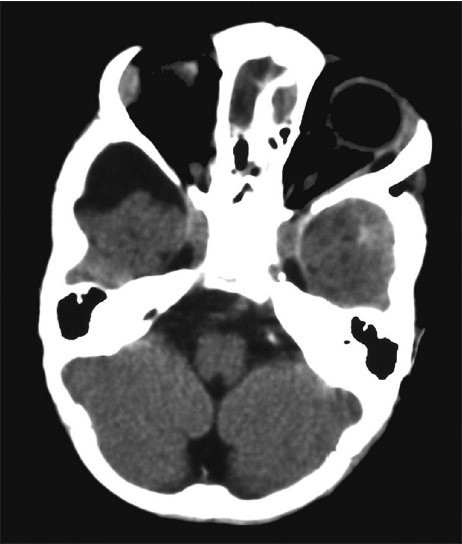 A 15-month-old female patient presented with head injury after a fall from downstairs. She immediately lost consciousness for a brief period and then generalized tonic-clonic epileptic fits started until she was transferred to the emergency room. After initial resuscitation and seizure control, the patient was sleepy with no focal neurological deficits noted on neurological examination. 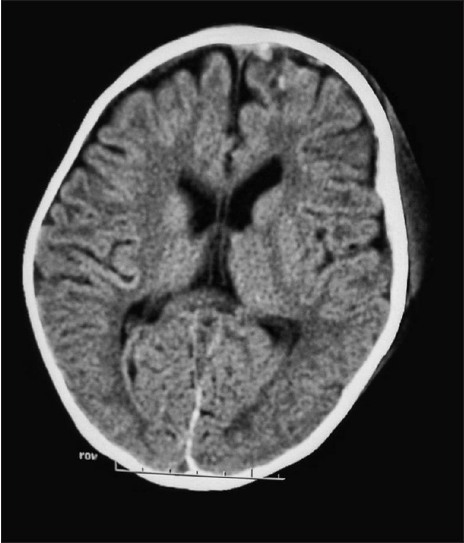 A CT scan of the brain revealed a left fronto-temporo-parietal acute subdural hematoma with no midline shift [Figure 1] and [Figure 2]. A right middle cranial fossa Type II arachnoid cyst was also noted in addition to moderate cerebral atrophy [Figure 2]. Conservative management with administration of dehydrating measures and close observation was decided based on the good clinical condition of the patient and the absence of focal neurological deficits and midline shift. A follow-up CT scan, done 12 h later [Figure 3], [Figure 4] and [Figure 5], revealed almost complete resolution of the hematoma. The patient was discharged 2 days later in a fit condition. We speculate that CSF jet flow between arachnoid cyst and subarachnoid space might have contributed to the rapid disappearance of the hematoma in our patient through a more vigorous CSF motion resulting in a more effective dispersal and washout of the hematoma. 1. Domenicucci M, Strzelecki JW, Delfini R. Acute posttraumatic subdural hematomas:" Intradural" computed tomographic appearance as a favorable prognostic factor. Neurosurgery 1998;42:51-5. 2. Mirzai H, Yaldiz C, Eminoglu M, Orguc S. Ultra fast resolution of acute post-traumatic subdural haematoma. J Neurol Neurosurg Psychiatry 2005;76:1738. 3. Inamasu J, Nakamura Y, Saito R, Kuroshima Y, Mayanagi K, Ohba S, et al. Rapid resolution of traumatic acute subdural hematoma by redistribution. Am J Emerg Med 2002;20:376-7. 4. Kato N, Tsunoda T, Matsumura A, Yanaka K, Nose T. Rapid spontaneous resolution of acute subdural hematoma occurs by redistribution. Two case reports. Neurol Med Chir (Tokyo) 2001;41:140-3. 5. Matsuyama T, Shimomura T, Okumura Y, Sakaki T. Rapid resolution of symptomatic acute subdural hematoma: Case report. Surg Neurol 1997;48:193-6. 6. Polman CH, Gijsbers CJ, Heimans JJ, Ponssen H, Valk J. Rapid spontaneous resolution of an acute subdural hematoma. Neurosurgery 1986;19:446. 7. Suzuki Y, Kawamata T, Matsumoto H, Kunii N, Matsumoto K. A resolving sign of acute subdural hematoma: from report of two cases. Neurol Surg 1998;26:1025-9. 8. Niikawa S, Sugimoto S, Hattori T, Ohkuma A, Kimura T, Shinoda J, et al. 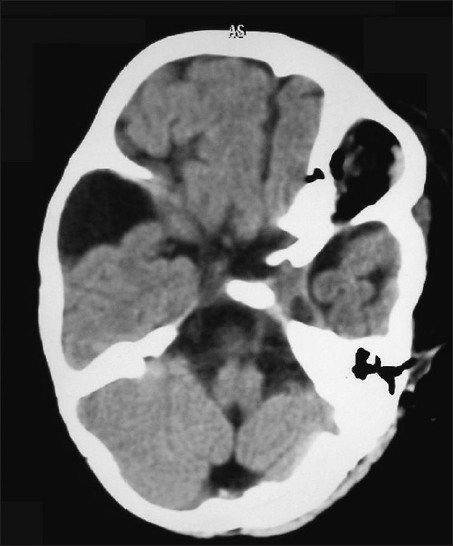 Rapid resolution of acute subdural hematoma-report of four cases. Neurol Med Chir (Tokyo) 1989;29:820-4. 9. Fernández-Portales I, Gómez-Perals L, Cabezudo JM, Giménez-Pando J, Figueroa JA, Yagudüe LG. Rapid spontaneous resolution of acute subdural hematoma. Neurocirugia (Astur) 2002;13:491. 10. Cohen JE, Eger K, Montero A, Israel Z. Rapid spontaneous resolution of acute subdural hematoma and HIV related cerebral atrophy: Case report. Surg Neurol 1998;50:241-4. 11. Kuroiwa T, Tanabe H, Takatsuka H, Arai M, Sakai N, Nagasawa S, et al. Rapid spontaneous resolution of acute extradural and subdural hematomas: Case report. J Neurosurg 1993;78:126-8. 12. Arai H, Sato K, Wachi A, Okuda O, Takeda N. Arachnoid cysts of the middle cranial fossa: Experience with 77 patients who were treated with cystoperitoneal shunting. Neurosurgery 1996;39:1108-13. 13. Callaway MP, Renowden SA, Lewis TT, Bradshaw J, Malcolm G, Coakham H. Middle cranial fossa arachnoid cysts: Not always a benign entity. Br J Radio 1998;71:441-3. 14. Galassi E, Tognetti F, Gaist G, Fagioli L, Frank F, Frank G. CT scan and metrizamide CT cisternography in arachnoid cysts of the middle cranial fossa: Classification and pathophysiological aspects. Surg Neurol 1982;17:363-9. 15. Crisi G, Calò M, De Santis M, Angiari P, Merli GA. Metrizamide-enhanced computed tomography of intracranial arachnoid cysts. J Comput Assist Tomogr 1984;8:928-35. 16. Galassi E, Tognetti F, Pozzati E, Frank F. Extradural hematoma complicating middle fossa arachnoid cyst. Childs Nerv Syst 1986;2:306-8. 17. Gentry LR, Menezes AH, Turski PA, Smoker WR, Cornell SH, Ramirez L. Suprasellar arachnoid cysts: 2. Evaluation of CSF dynamics. AJNR Am J Neuroradiol 1986;7:87-96. 18. Eguchi T, Taoka T, Nikaido Y, Shiomi K, Fujimoto T, Otsuka H, et al. Cine-magnetic resonance imaging evaluation of communication between middle cranial fossa arachnoid cysts and cisterns. Neurol Med Chir (Tokyo) 1996;36:353-7.